Check out our latest updated article on these scams, posted July 7, 2016. 2. Scams Targeting Care.com Users… Again! 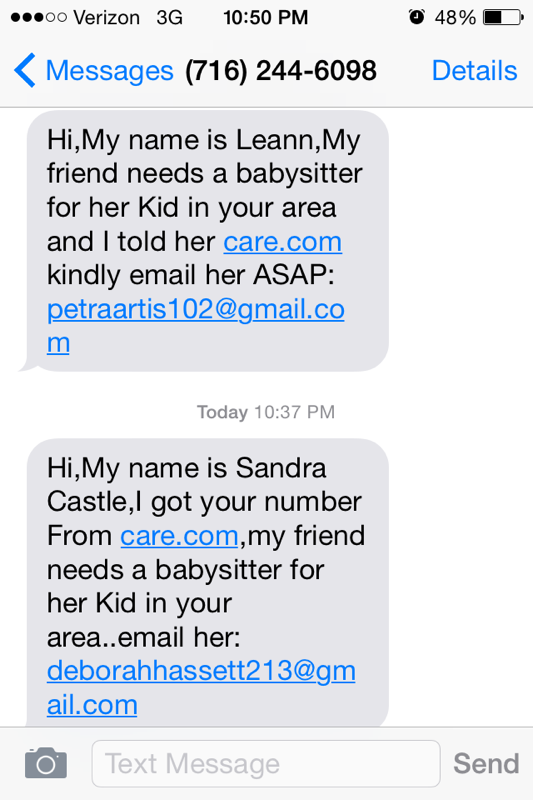 I was recently contacted in December by text for a babysitting job by a woman named Dawn. 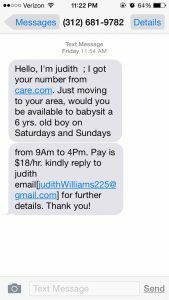 The text explained that she was hard of hearing and also moving to my area in search of child care. I do not know how to get this story out other than report it to the cops. Hopefully the word will spread from my story as well as others so that these scams will stop. My mom warned me that this might be a scam so I did research on the phone numbers and name she used. I got increasingly worried when I got another text from the same area code but from a different woman named Christina Morgan. It was very similar, asking for child care and claiming to be moving to my area. I then confronted Dawn and agreed to give the money back and watch her son for free. But then Dawn threatened to have the cops come check finger prints on the check to make sure it wasn’t manipulated before I returned it. It was at this point that her tone changed completely and the grammar and English got worse. She also became aggressive and rude. I ignored the bad English because I believed since she was hard of hearing that she would not be perfect at typing but I now know English is not a first language for [many] scammers. This is the email I received after sending my resume. “Hello, thank you for responding to my text…Its my break time and i want to use the opportunity to email you, I live in Hollywood, Florida, but i am moving to your area on 21st of December and i will need a babysitter for my 6yrs old Son or house keeper immediately, Depend on what time you will be available for him or the house keeping position and hrs if i am okay by it and i will also need you for an errand to help my mom pay her bills,do some shopping for my mom and son and pay for the furniture for my new house as started in my text. Please let me know if you also work on weekend and make sure you let me know when its convenience for you. More importantly, I am willing to pay you just try and get back to me and let me know how much you want for the childcare or house keeping and the errand helper, which i will pay you separately and handsomely for the errand because i will need to get some thing fix before i move down, like the furniture bills, mom bills and some little stuff. I really need a honest and responsible person. This could be a temporary/permanent job. It depends on what your schedule looks like but i do like to be sure if you are available the first month. I am moving to a new house that i need to fix some interior and get furniture and have contacted the furniture company because i don’t know if you will like to stay in my house or you want my son to stay with you that really depend on what you want. I will let you know as soon as we finalize issues. I will like you to send me your complete name, address and cell phone number so i can include that to my payroll for the period. I also will like you to tell me a few things about yourself. Here is a little about me. I am a single mother, I am 39 and i am hard of hearing. I have lived in Clayton, North Carolina before. I attended North Carolina School for the Deaf because i am hard hearing, where i achieved my highest qualification. I have my own business (Self Employed). I am never married. I attend the catholic. You will get to know more when we meet. Kindly include in your email your complete name, address and also your cell phone number so i can text you in case i need to pass an urgent information. NOTE : let me know your charges hourly or daily for the weekdays only? and any other thing you think jason will need so that i can make provision and also if there is anything you need to get to take care of him,please do tell me so that we can make all necessary arrangements prior to our arrival date. learn from your past mistakes,An ready to give you a chance. 5)where are you located presently and what is the address of McDonald’s close to you ? 8) Date Of Birth ? How are you doing? I’m Amanda Linda and my husband name is Richard, I ask my Friend to help me seek to Babysitter and housekeepers. We are relocating from Australia to your neighborhood. I recently got a contract with a company on a private research job. However, We need someone That will help in running some errands and babysitting few. WHICH CITY AND SOUTH-BURBS are you? We need someone to work 3 days per week 4 hours per day and includes job to pick up of our baby from daycare a few blocks away, Someone that is mature Whether young or older, loves children, reliable and punctual. The Nanny will take care of a 3yr old boy for three days a week and will Have to take baby home, give him a bath, dinner His hair brush, clean His lunch kit / bag, back pack put away clothes away and monitor school him with the Best care possible.We are willing to Provide Subway card to pick him up at daycare. Responsibilities will be for baby to look after him feed him meals, bath, keep him safe and clean of course change diapers regularly. My kid is my life so i entrust you to give him the best care .. I will be Offering you $450 weekly, i will be Needing your services for 4 hours at any suitable time of yours Between Monday, Wednesday and Friday. If you believe you are fit for this position in as much you will prove yourself to be a reliable and good person, I will instruct my financial to pay for the first week before our arrival so as to secure your service in advance. I will be waiting to hear from you. I’m James Keller by name married with 2 kids John 6yrs and Rose 4yrs, My family and i are relocating to your neighborhood from Canada. I recently got a contract with a company on a private research job. However, We need someone who will help us take care of the house and babysit while we are working, I am willing to pay $600 weekly, i will be needing your services for 6 hours for each days Monday through Friday let me know your available hours. If you believe you are fit for this position in as much you will prove yourself to be a reliable and good person, I will instruct my financial to pay you for the first week before our arrival so as to secure your service. I and my family will be arriving in 2 weeks time. Please send your resume and references. Thanks for your mail, my accountant will be making out a check to you before our arrival. You will receive a Certified Company Check which you will deduct your wages for the first week and the remaining funds will be used to buy foodstuffs and furniture needed in the house. You will be getting the foodstuffs before the day of our arrival which will be in Next Week. Actually our flights from canada will arrive at nights so you will be getting the foodstuffs in the morning and making all other preparations. I will also instruct my estate agent to mail the keys of the apartment to you so as to do all other necessary preparations before we arrive. My financial would be needing the following Information to make out the check. All I need from you is total honesty and sincerity. I know you will be committed to the work and i will be waiting to hear from you. The Care.com member goes on to say… I work as a teacher, from 7-3 every day and have some obligations week days in the afternoons… Coaching archery, assisting the basketball teams, and various meetings. I also have a dog that I love dearly. When James Keller said 6 hours a day, I replied and said that wouldn’t be possible with my current situation. I offered my time for weekends or as a date-night sitter. When he still referred to the original 6 hours/day arrangement, I replied and said that I wouldn’t be able to help them out at all. He hasn’t replied since then. The request from Amanda Linda started with a text message from a lady who said she got my number off of Care.com and that her friend was in the area and needed a sitter. So I inquired. I’ve been babysitting for 12 years now and a lot has come through word of mouth. So it wasn’t at all odd that a woman emailed and asked me to contact her friend. My phone number isn’t posted on the Care.com site itself, but I leave it when I message people for jobs on the site. Regardless, after hearing the same spiel twice, with very little difference, I will be blocking the phone numbers and emails associated with these people and watching what information I leave on Care.com. Mr. Burns wrote to TDS to say that his daughter was contacted from her profile on Care.com to be a babysitter for someone moving from Australia to Oklahoma. She was sent a check for $2,750. She was to send $250.00 by Western Union to a man in Nigeria for art work that was to be shipped to the apartment. His daughter was also meant to withdraw her first weeks salary from this check. Being naïve and trusting, she did as asked. The $2750 check was fraudulent, of course. However, the fraudulent check was crafted so well that it took the bank several days to realize the fraud and notify his daughter. Fortunately, the daughter only lost $300 which she had wired to Nigeria (including wire fees). I received a text from a woman claiming her name was Melissa Samuel, with almost the exact same text as the scam that is currently in this article. I had already responded to her with an email 13 days prior to this text and this was her response. After reading your article, I will certainly not be replying to any more of her messages. Thanks for your reply i am deeply sorry for the late respond. My name is Melissa. I recently moved from Delhi New York to Florida with my family but i`m moving to your area on 12th of march and i will need a nanny for my son immediately. His name is Joe, 6 years old boy and the time would be from 9 am to 4 pm Saturdays and Sundays only. This is a long term position but its fine to start temporary. Some weekdays are also flexible if you are available but we may need to discuss that in person. I`m willing to pay $18/hour. I believe its a great pay and i`m paying that much because i want quality care for my son. The start date is 14th of march. I lost my husband and a 4 months old baby in April. It was my late husband’s birthday and he decided to take the kids out while i was still at work. Joe happens to be the only survival from the accident but he currently uses a wheelchair. I have had terrible times in the last few months and this is one of the reasons i have decided to move because staying here brings back some sad memories. Kindly be honest if you have experience with childcare because i want the best care for Joe. I`m hard of hearing and can only communicate via writing, reading lips or text messaging. I hope that isn’t a problem? I`m easy going and love to laugh. I can send you a picture of me and Joe in my next email. I am so upset. I thought I would finally be able to afford to move out of this terrible neighborhood that I’m in. Anyway, all of this has been happening this week and now I don’t know what to do. She says she’s sending me a check next week. Should I take it? Should I tell her not to send it? She knows my address but not my apt number. Thank you for this site! I would have been in big trouble if not for you! TDS advised her to do what made her least anxious and most comfortable. However, if willing, we ask anyone being contacted by these scammers to continue deceiving the scammer in order to receive the fake check. Once you have the check you can reveal your awareness of the scam and tell them you are contacting the police. Please send us a copy (photo) of the check AND the mailer it arrived in, and then contact your local police. We are happy to contact the banks and businesses that are also being defrauded. Doing these things helps to put the scammers out of business, slow them down, and cost them money. This is the EXACT response from the previous scam you reported. I responded at that time because I thought it was a real person, not a scam. She sent me the sad, sorry picture of her and her son who was in the wheelchair. I now discovered that downloading this photo also led to adware being installed onto my computer. I know this because it was the only thing I did on my computer that day, and all the adware was installed at the same time I downloaded the picture. I managed to email back and forth with her but she never responded to any of my questions for her. I got all the way to the part with the wheelchair. It sounded immediately like a scam to me, where in the end I would owe someone a hefty amount of money I don’t have. I looked up Care.com scams and found out that this is the #1 scam happening on Care.com. I didn’t respond any longer, but am still getting spam with this sicko asking “Did you get my message? Respond to me ASAP.” Although I would never have sent this person $3000, and I would have turned in the fake check to the FBI, I feel lucky I didn’t fall for it any further or have something worse happen. 4)Do you have any criminal records?doesn’t really matters to me as long as you have learn from your past mistakes,An ready to give you a chance. She sounded like a lunatic to me. I already knew I wasn’t going to respond to someone who wanted me to pay their bills for them. But, the .jpg she sent me was titled “me and Jamie”. Wouldn’t it be “me and Sarah?” This scammer obviously couldn’t follow their own lies. The picture is of a blonde woman with a little blonde girl taking a selfie on a carousel. I know there is a lot here but I wanted to give as much information as I could so others know how to catch it as well. I’m in the process of turning in the email users to gmail as serious offenders as I get rid of the massive amounts of adware on my computer. As for the phone numbers – I wished I looked them up right away. It should be a red flag right away if the telephone number isn’t from where they say they are from. I’m trying to find out how to turn them in. Thanks for replying to my text. 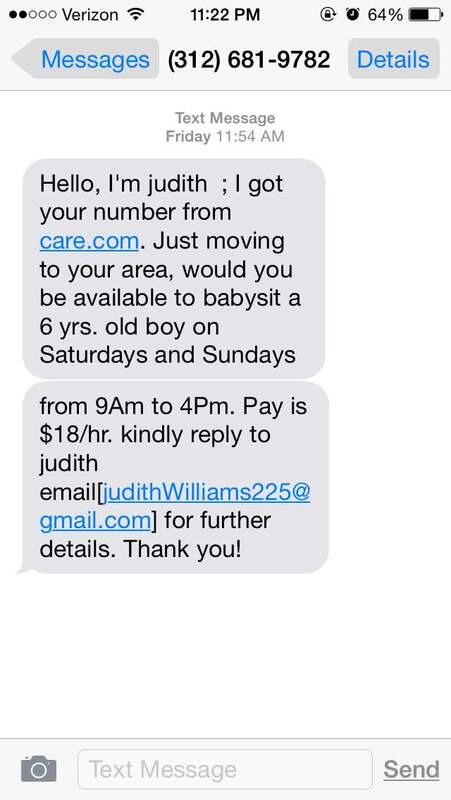 My name is Judith. I recently moved from Plano, TX to Phoenix, AZ to with my family but i’m relocating to your area on 9th of April and i will need a nanny for my son immediately. His name is Joe, 6 years old and the time would be from 9 am to 4 pm Saturdays and Sundays only. This is a long term position but its fine to start temporary. Some weekdays are also flexible if you are available but we may need to discuss that in person. I`m willing to pay 18/hour. I believe its a great pay and i’m paying that much because i want quality care for my son. The start date is 11th of April . I lost my husband and a 4 months old baby in July. It was my late husband`s birthday and he decided to take the kids out while i was still at work. Joe happens to be the only survival from the accident but he currently uses a wheelchair. I have had terrible times in the last few months and this is one of the reasons i have decided to move because staying here brings back some sad memories. Kindly be honest if you have experience with childcare because i want the best care for Joe. I`m hard of hearing and can only communicate via writing, reading lips or text messaging. I hope that isn’t a problem? I`m easy going and love to laugh. I can send you a picture of me and Joe in my next email. It will be nice to read about you. I want a nanny who is willing to be a friend and family. Please note that i have a few applicants for this position but i made you our first choice so i wouldn’t appreciate a waste of time. Make sure to include your complete name, address including zip code and cell phone number in your response so i could have my agent check the map to read the distance between us also to have your address on file. You may ask questions in case you have any. I await your quick response. It was almost identical to the email that you have posted in your articles about the woman losing her husband and baby, leaving her with a 6 year old in a wheelchair now. She changed the areas she was from and her name, but didn’t change her son’s name. I almost fell for it. I had emailed her back and given her my name, number, address and told her a little about me, and then mentioned my husband is a firefighter/paramedic. I received no response from her after that. My husband was suspicious of the email and after trying to find the number she texted me from and the email she used (Google said the email didn’t exist and the phone was from Chicago where she didn’t say she was from) my husband told me to Google some of the wording in the email. Sure enough I was directed [to TheDailyScam.com article]. I wanted to share this with others to let it be known that this scam is still happening. When I found out about it I emailed her again and told her a family member of mine had a stroke and I needed to fly to another state to take care of them and wouldn’t be back for her and her sons arrival. 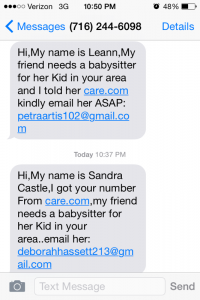 And finally (for now), another Care.com user who asked to remain anonymous, sent us this this screenshot of two texts that came to him within minutes. This young man was targeted by the Care.com nanny scam back in October so he’s quite a bit more savvy now! TheDailyScam will continue to keep readers updated as long as we receive new information. Please spread the word about these advance-fee scams. If you are a Care.com member, please pressure them to be more forthcoming to their members on how to recognize and avoid these scams.